Earlier this week, the University of Maryland and their athletic uniform supplier, Under Armour, announced that the university’s football team “will wear football uniforms inspired by the 200th anniversary of the Battle of Baltimore and the writing of ‘The Star-Spangled Banner’ when it hosts West Virginia at Byrd Stadium” tomorrow, September 13. The game will be played exactly 200 years to the day after Francis Scott Key penned “Defence of Fort McHenry,” a poem later set to music and adopted as the national anthem of the United States, which helped ensure that the all too oft-forgotten War of 1812 would retain some place in America’s collective memory. 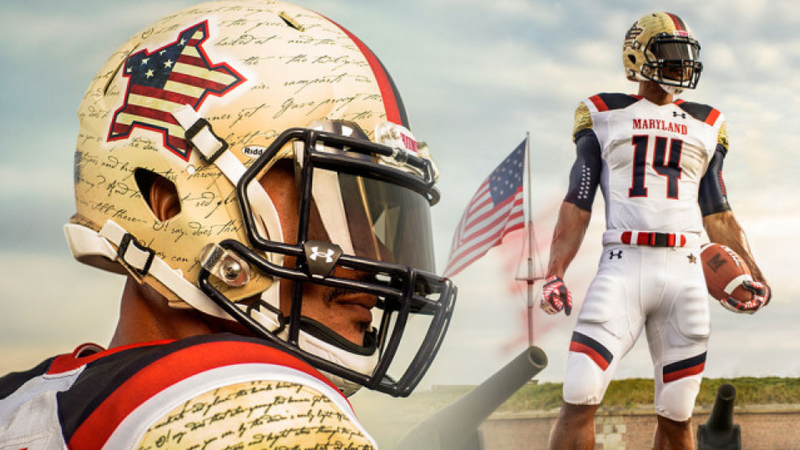 The uniforms (full gallery here) feature, most notably, “the cursive script of … Key’s poem” on both the helmets and jersey sleeves, along with “an outline of the star-shaped Fort McHenry and an image of the flag that flew through the night during the Battle of Baltimore” on the helmet and “red and blue stripes on the helmet, shoulders, pant legs and socks.” Additionally, “Maryland captains will wear red belts as American military captains did during the Battle of Baltimore, and players’ names will be replaced by the word ‘TRIUMPH’ on the back of their jerseys. The team’s base layers will include the phrase ‘Conquer We Must'” (phrases culled from the Anthem’s lesser-known fourth verse). I’ll leave it to others to analyze the sartorial merit of the uniforms and to critique and satirize them as only the most recent example of the sports world’s appropriation of hypermasculinized military imagery. Instead, I’d like to offer some admittedly scattered thoughts on the uniforms as an expression of the ways in which the War of 1812 is remembered in America. I snarkily wondered if “Conquer We Must” could more appropriately be replaced on the pant leg with “Status Quo Ante Bellum,” and wondered if adding a single character to the nameplate on the shoulders would more accurately convey the War’s legacy. Heck, even if we give the team and manufacturer the benefit of the doubt and limit the discussion to the Battle of Baltimore, I’m not sure “triumph” and “conquer” work very well. That’s especially true if we focus on the events that occurred at Fort McHenry, where American troops were not out to conquer anything, instead narrowly repelling British efforts to seize the fort. Taylor’s The Civil War of 1812 is only one of several recent books seeking to both complicate our understanding of the War and clarify its significance and legacy. His own more recent followup, The Internal Enemy (see Roy Rogers’s review here), shifts attention from the U.S.-Canadian borderlands southward to the Chesapeake and the central role played by black Virginians in transforming the War’s outcome, altering Virginia’s political relationship with the nation and setting America on a path towards Civil War in the process. It is the work of Nicole Eustace, though, to which my mind was drawn as I reflected on Maryland’s uniforms and their selective portrayal of the conflict 200 years ago. In 1812: War and the Passions of Patriotism, Eustace demonstrates that the War was fought not only on the battlefield and waterways but also in the minds of ordinary Americans, “very few” of whom “experience[d] any direct impact of the conflict.” From the War’s outset, newspaper editors, writers, and political cartoonists, among others, used the war to “appeal to a model of patriotism based in romantic love” and valorized population growth and territorial growth as the surest signs of America’s greatness. “Throughout the War of 1812,” Eustace writes in the introduction, “popular conclusions about the meaning of events were liable to be based more on the emotional language used to describe them than on rational appraisal of what had occurred.” That process continued in the War’s aftermath, as politicians, poets, and playwrights helped usher in an “era of good feelings” in part by portraying the now-concluded conflict as a resounding success. To the “books and broadsides” in which Americans staked a claim to the War’s ultimate meaning, we can now add football uniforms. Maryland and Under Armour’s selective use of the Star-Spangled Banner’s lyrics is best understood as part of this much larger history of Americans appropriating the War of 1812’s legacy. During the Civil War, Union soldiers sang a fifth verse penned by Oliver Wendell Holmes that decried “the traitor that dares to defile / The flag of her stars and the page of her glory.” That verse, which also celebrated “the millions unchained who our birthright have gained” stood in unaddressed contrast to the anthem’s third verse, which denounced earlier British efforts to emancipate enslaved African Americans (“No refuge could save the hireling and slave / From the terror of flight, or the gloom of the grave”). That third verse is now omitted from almost all printings of the National Anthem, marking yet another shift in our collective memory, one that rejects the nation’s racist past in part by ignoring that racism’s legacy and modern manifestations. That process also began much earlier, when Americans used the War of 1812 to help justify westward expansion at the expense of Native Americans, and I wonder if our collective forgetfulness would’ve permitted the Maryland Terrapins to wear their War of 1812-inspired uniforms tomorrow if they were facing off not against the West Virginia Mountaineers, but rather the Florida State Seminoles. Neither that hypothetical nor the War of 1812’s contested meanings likely crossed the minds of Under Armour’s designers, Maryland’s athletic director and coaching staff, or the rank-and-file fans caught up in the patriotic fervor of the whole affair. I hope, though, that the uniforms and their embedded meanings might catch the interest of a few fans and spark a conversation about the War’s messy details and complicated legacy. Ironically, at least for the purposes of this post, Under Armour opted for the British spelling of their company name. I will note that while Maryland’s uniforms mark a noted departure from the military camouflage and American flag-obsessed stylings of other teams, they are not the first to feature an early American historical document on their jersey. That honor belongs to the Bakersfield Condors, a minor league team that plays a sport invented in the country that Americans unsuccessfully tried to invade in the War of 1812, who last year wore sweaters emblazoned with the words of Abraham Lincoln’s Gettysburg Address. Alan Taylor, The Civil War of 1812: American Citizens, British Subjects, Irish Rebels, and Indian Allies (New York: Vintage Books, 2011), 10. Nicole Eustace, 1812: War and the Passions of Patriotism (Philadelphia: University of Pennsylvania Press, 2012), xvi, 227. I would not be surprised if you polled the fans in the parking lot, at least a third will think the War of 1812 was when Teddy Roosevelt rode up San Juan Hill, half won’t be able to tell you anything about it, and the majority of the remaining fans would have s few facts right and most wrong. As someone of more recent Native American descent than many, I never really feel much righteous indignation about my ancestry’s fate. I am more bothered by the treatment of the Irish line in England during the potato famine cleansing of the Irish, but that is just the American in me coming out I suppose. 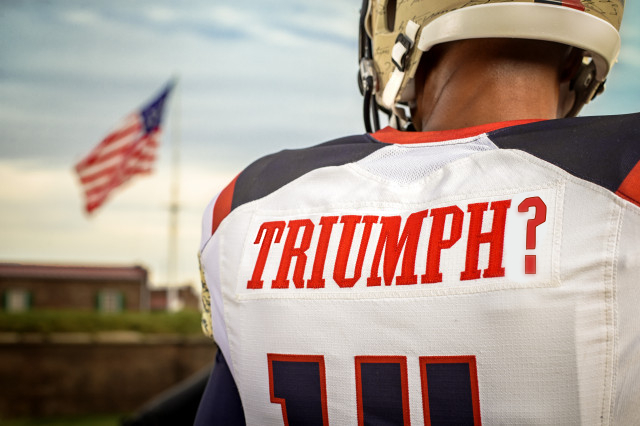 I suspect “Triumph” and, especially, “Conquer we Must” might have something to do with that fact that it’s a football team playing a football game.